Limavady United new manager Sean Friars. SEAN FRIARS is relishing the challenge of his first senior football management job after taking over as Limavady United boss this week. The 39 year-old former Institute forward stepped down from his position as ‘Stute’s U20 coach to take over from Paul Owens as manager of the Roesiders, where he played briefly in the 2006-07 season. And the ex-Liverpool and Ipswich Town man, who also won an FAI Cup medal in 2002 with Derry City, is confident he can meet the challenges the job brings head-on and fill the big boots of Owens, who has since taken up a coaching role with Coleraine after his three-and-a-half year stint as Roesiders player/manager came to an end. Friars, who will bring another ex-United player, Ryan McCreadie, in as his first-team coach, insists he’s excited about where he can take the club and is hoping to begin his recruitment drive as soon as possible. Explaining his decision to go for the vacant position, Friars said it ‘ticked all the boxes’ and his first signings for the Roesiders is his brother Emmett, who joins from Ballymena United, while ex-'Stute striker Alex Pomeroy has also signed up for the 2018/19 season. “When I met up with them I liked what they were saying,” he said. “It was a difficult decision for me to leave ‘Stute because I’ve built up a great relationship with the people at the club and the team. “But with the Limavady job, everything I was asking and everything I needed to make a good go of it was given. Friars pipped a number of ‘strong candidates’ for the post, including professional coaches from Spain and Portugal, but the club decided the Galliagh native was the best man to take them forward. “The club went down the right channels and asked permission to speak with Institute last week,” explained Friars. “And then they went through their interview process and got back to me late Friday night and said: ‘listen, you’re the new No. 1 if you accept it’. “You’re always a wee bit surprised because you know there’s that many people in for it. 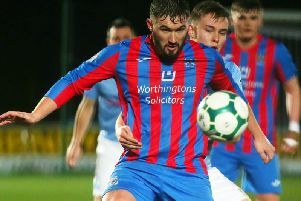 Despite a limited budget, Friars is confident he can build a squad capable of holding their own in the Bluefin Sport Championship next season and didn’t rule out approaching his former club for the services of some of its talented U20 players. “I want to give first opportunity to some of the boys up at Limavady and see where their heads are at and I have a few boys I want to bring in. “But if I feel some of the (Institute) U20s want an opportunity to experience senior football and I feel they are more than capable, which a few of them are, then I’ll bring them on to cut their teeth. “I think anyone looking at the league will have ourselves and a couple of other teams down as one of the relegation favourites because of how the season ended last year and how strong the Championship is this year but if I can get in what I need in, I’ve got goals and ambitions and I would like to think we could stay well clear of relegation.